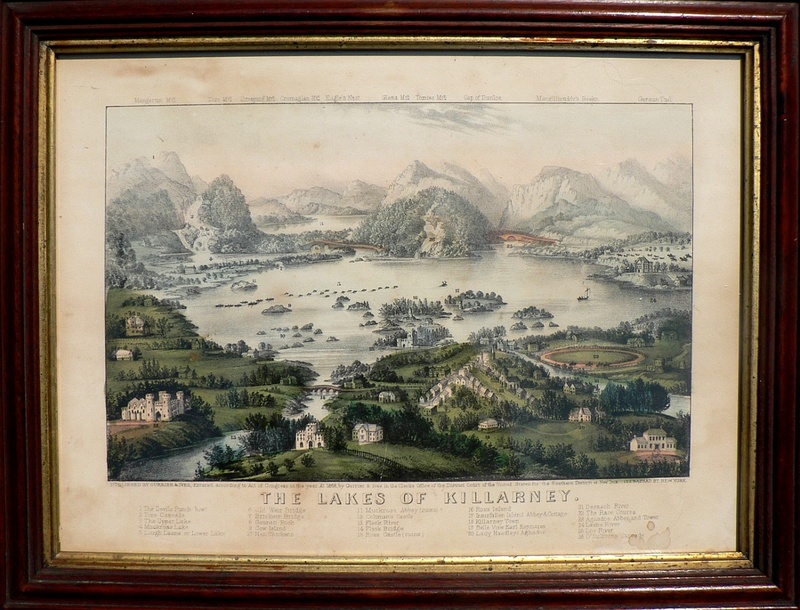 A beautiful view of the three small lakes in southwest Ireland whose many small islands, surrouunding mountains, and medieval castles are popular tourist attractions. The key below identifies the Devils Punch Bowl, the Toto Cascades, the Upper Lake, Muckrose Lake, Lough Leane or Lower lake, Old Weir Bridge, Brickeen Bridge, Gannett Rook, Cow Island, Hens and Chickens, Muckross Abbey ruins, Coltman&apos;s Caste, Flask River, Flask Bridge, Rose Castle ruins, Ross Island, Innisfallen Island Abbey & Cottage, Killarney Town, Belle View Earl Kenmares, Lady Headleys Aghadoe, Deenach River, The Race Course, Aghadoe Abbey and Tower, Laune River, Loe River, and O&apos;Sullivans Cascade. 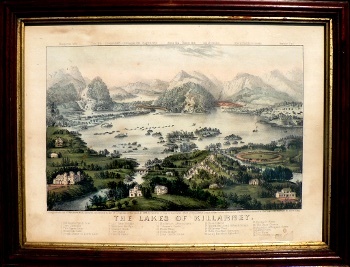 Hand colored lithograph with beautifully preserved original hand coloring. Framed in museum specifications in antique mahogany frame with gold liner and old glass. Finished dimensions of 13 x 17 inches.